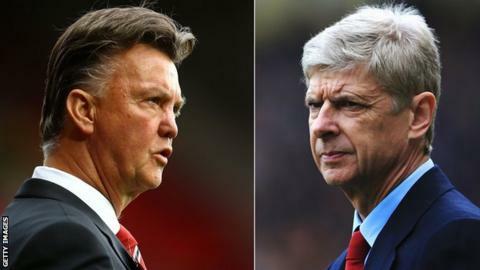 Arsenal manager Arsene Wenger says rumours about Manchester United boss Louis van Gaal's position are "disrespectful". Dutchman Van Gaal's future at Old Trafford is reported to be in doubt after a run of six games without a win. Jose Mourinho, who was sacked as Chelsea manager last week, has been linked with the Old Trafford job. "I do not want anyone to lose their job. My personal feelings on that front is that it is always sad," said Wenger. Later on Wednesday, Van Gaal walked out of his own pre-Boxing Day news conference - which lasted four minutes 58 seconds - after answering just three questions from reporters. Van Gaal, 64, admitted after Saturday's 2-1 home defeat by Norwich that he was "worried" about his position, while former United player and coach Phil Neville said the club faces "a reality check", though he added they should stand by the Dutchman. Defender Phil Jones has lent his support to his manager saying he was doing a "terrific" job at the club. Frenchman Wenger, 66, added: "I do not want to go into a world of speculation. "I personally have a huge respect for Louis van Gaal and I think what is going on there is disrespectful. "This guy has worked for 30 years in football and has delivered unbelievable quality of work. I think a lot has been made on [Mourinho's departure], and I do not need to add anything." Another manager who has been linked with a move to the Premier League is Pep Guardiola, who said on Sunday he will be leaving German champions Bayern Munich at the end of the season. But to make the announcement in December does not sit right with Wenger. He said: "I don't like the fact that the managers come out so early for what they will do, because it's not necessarily good for their own team, nor for the speculation about the managers who are going through a little bit of a difficult patch." Asked if he would encourage Guardiola to come to England, Wenger replied: "Yes, I would welcome [him] to the competition."